I'll begin by wishing you, in advance, a Happy Philly Beer Week. And then excuse myself as the festivities roll on - without me this year. 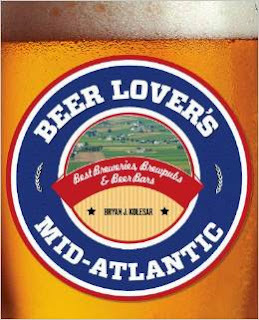 As I mentioned back in April, I'm off on a wild trip of writing "Beer Lover's Mid-Atlantic". Really, it's been going on since February. I've been somewhat surprised, I must admit, at how many still had no clue. I think that for as much as I've done to "socialize" it through the channels that are supposed to be more effective than "old school blogs", etc. (Facebook and Twitter postings along the way, photos, lots of photos, etc. ), the message still isn't completely out there. I'll assure you that it's for real. Contract real. 5,194 driving miles to-date real. 240 visits for real across PA/NJ/DE/MD. From Erie to Eastern Shore, from Hoboken to Hagerstown, from Scranton to Solomons Island, and from Danville to Downingtown to Delmar. For those on both sides of the bar that have been cooperative and helpful in terms of sharing information, tips, etc. it has been immensely helpful as I continue to crunch on this extremely aggressive timeline. So I'll be in Hoboken, Jersey City, and other parts of northern New Jersey this weekend, continuing along the path of writing this book. Join me along the way…because, if you didn't know, now you know. Cheers and enjoy Philly Beer Week!